The C-Class Coupe is fitted as option with Mercedes Benz's 'PRE-SAFE®' system which senses when an accident is about to occur and primes the restraint and protection systems in readiness for the collision. In Euro NCAP’s frontal and side barrier impacts, the PRE-SAFE® System was not activated. In the frontal impact, the passenger compartment remained stable. Dummy readings indicated good protection of the knees and femurs of the driver and passenger. Mercedes Benz showed that a similar level of protection would be provided for occupants of different sizes and those sat in different positions. In the side barrier test, the C Class Coupe scored maximum points, providing good protection of all body areas. In the more severe side pole test, protection of the chest was adequate and that of other body regions was good. The C Class Coupe is equipped with an 'active' head restraint. The car automatically detects when it has been struck from behind and the front surface of the head restraint is moved forward, providing earlier support to the occupant's neck. Mercedes Benz showed that the system would work over a broad range of speeds and impact severities. In Euro NCAP's tests the seat and head restraint demonstrated marginal protection against whiplash injuries. In the frontal test, forward movement of the 3 year dummy, sat in a forward facing restraint, was not excessive. In the side impact, both dummies were properly contained within the shells of their restraints, minmising the likelihood of dangerous head contacts. . The passenger airbag can be disabled for Mercedes Benz child restraints if the car is equipped with an optional, automatic-detect system known as CPOD. The system does not meet Euro NCAP's requirements and was not rewarded. The passenger airbag can also be disabled by Mercedes Benz dealers, allowing a rearward facing child restraint to be used in that seating position. Clear information was displayed in the car regarding the dangers of using a rearward facing restraint in that seating position without first disabling the airbag. The bumper scored maximum points for its protection of pedestrians' legs. However, the front edge of the bonnet provided predominantly poor protection. The C Class Coupe has an active bonnet. Sensors detect when a pedestrian has been struck and actuators raise the bonnet to provide greater clearance to hard structures beneath. Mercedes Benz showed that the system would detect a range of pedestrian statures and would work over a broad range of speeds, so the bonnet was tested in the raised position. In most areas likely to be struck by a child's head, the bonnet provided good protection. An adult's head might strike on the bonnet surface, where the car offered good protection, or on the windscreen, where protection was poor. 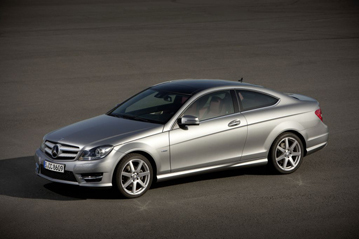 Electronic stability control is standard equipment on all C Class Coupes, and met Euro NCAP's test requirements. A seatbelt reminder system is standard for the driver, passenger and rear seats. A driver-set speed limitation device is available as an option but did not meet Euro NCAP's fitment requirements for assessment in 2011.